Leonie Swann is a nom de plume. (ger)Leonie Swann ist ein Pseudonym. Thursday, June 6, 2013, 7 pm. Book: Three bags full: A Sheep Detective Story by Leonie Swann. Come and discuss Three bags full: A Sheep Detective Storyby Leonie Swann with the Dragonfly Books discussion group! We will meet at Dragonfly Books on Thursday, June 6 at 7:00 pm. Plan to arrive early to visit and to shop. This is your opportunity to meet other readers in the community and to discuss some great books. This complimentary event is open to the public. We always welcome new members to our book discussion night. No pre-registration is necessary; however it will be helpful to have read the book being discussed. Light refreshments provided. 10% discount offered on all book club purchases. Leonie Swann , Three Bags Full: A Sheep Detective Story. 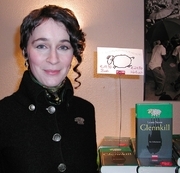 Leonie Swann is currently considered a "single author." If one or more works are by a distinct, homonymous authors, go ahead and split the author. Leonie Swann is composed of 2 names. You can examine and separate out names.